Alexia Maccon, the Lady Woolsey, awakens in the wee hours of the mid-afternoon to find her husband, who should be decently asleep like any normal werewolf, yelling at the top of his lungs. Then he disappears; leaving her to deal with a regiment of supernatural soldiers encamped on her doorstep, a plethora of exorcised ghosts, and an angry Queen Victoria. But Alexia is armed with her trusty parasol, the latest fashions, and an arsenal of biting civility. So even when her investigations take her to Scotland, the backwater of ugly waistcoats, she is prepared: upending werewolf pack dynamics as only the soulless can. She might even find time to track down her wayward husband, if she feels like it. 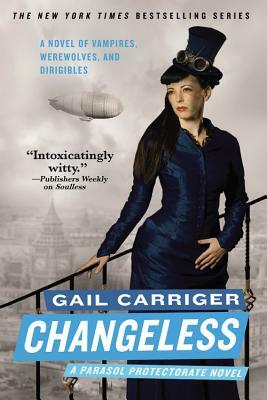 CHANGELESS is the second book of the Parasol Protectorate series: a comedy of manners set in Victorian London, full of werewolves, vampires, dirigibles, and tea-drinking.